E-mail authentication became more and more important as e-mail phishing attacks grow and the average loss for mid size companies become bigger and bigger. EasyDMARC’s SPF record lookup tool shows that 68% of checked domains have issues with SPF record. In general, e-mail authentication can be reached by SPF, DKIM, DMARC protocols. SPF, in particular, is the mechanism that prevents fraudsters and hackers from sending unauthorized e-mails on behalf of corporate domain. From configuration’s standpoint SPF is a DNS TXT record. The SPF txt record defines authorized sources such as domains or IP addresses. 3. And finally, after DNS propagation run the SPF record lookup tool to be sure that SPF lookup has no failures. and at last, -all is the published SPF policy. To simplify SPF record creation you can use any free SPF record generator. EasyDMARC’s SPF Record generator is particularly made to make the process easy and fast. You can include several SPF records into each other but due to security reasons SPF record can’t have more than 10 lockups. If you have more then 10 SPF lockups you need to fix it with SPF lookup tool or you can ask EasyDMARC support to help you, otherwise e-mail service providers will skip your SPF record. You can concatenate multiple strings together without adding spaces. This is quite an advanced configuration and requires experience to set this up smoothly in short time. If you have difficulties you can always reach EasyDMARC support. 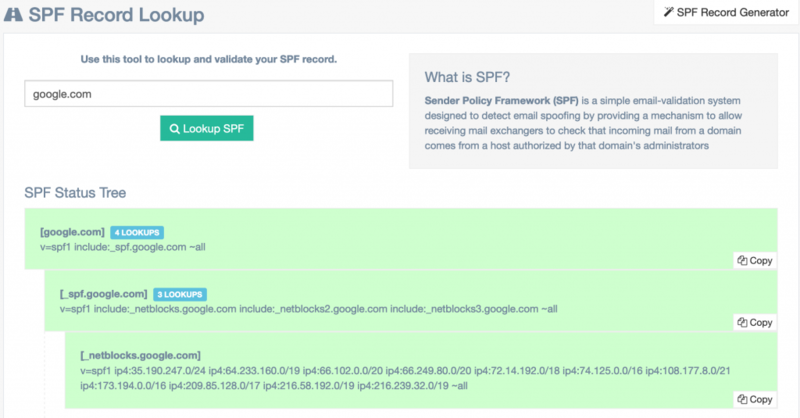 After DNS propagation you need to check the record with SPF lookup tool. If you see green color without mentioned issues – then you did it! Generally speaking after publishing good SPF record you have done the first step for your e-mail authentication process. After it you need to publish your DKIM and DMARC records. Furthermore, we recommend to use monitoring and alerting for your SPF record. You should maintain it to have latest correct values and not be outdated. Remember that outdated SPF record may result in e-mail rejections. As can be seen manual setup is quite tough and there are many places to [do wrong things]. That is why we created EasyDMARC. EasyDMARC guides you step by step to reach perfect e-mail authentication in short terms. How to fix "No DMARC record found"